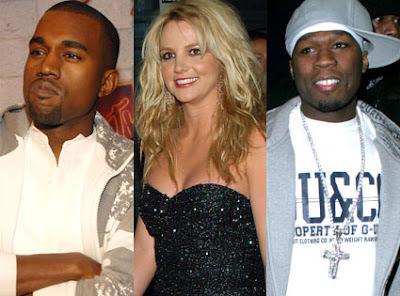 Along with 50 Cent taking up for Britney Spears. Fiddy says West is just "not used to not being recognized." Kanye "thought Britney shouldn't actually be opening the show. Almost like he forgot that Britney Spears sold 50 million records…He's not thinking about her full body of work. She deserves to headline the show better than anyone else that was on it. Even in the state she's in right now." As for when MTV cut away to Fiddy's WTF?! face during Britney's "performance," he says, "I seen her do the run-through, and she was a lot more relaxed…It was a lot more entertaining without the celebrities in front of her. She started thinking about what these people are thinking." Brit's insecurity is apparently so heartbreaking Fiddy felt even worse when Sarah Silverman made her "little jokes," and our fallen pop star "just went to crying.